Hi all. School has officially turned me into a hermit. I have not been showering as regularly as one should, and leaving the house for any reason other than school is unheard of. Since I haven’t and won’t have time to do any real blogging for a while, I leave you all with a delicious recipe for a vegan sweet potato pie (the best pie I have ever had, gluten free too!) and this picture. See you all when I have a life again. Animals that care for different animals are the cutest ever. 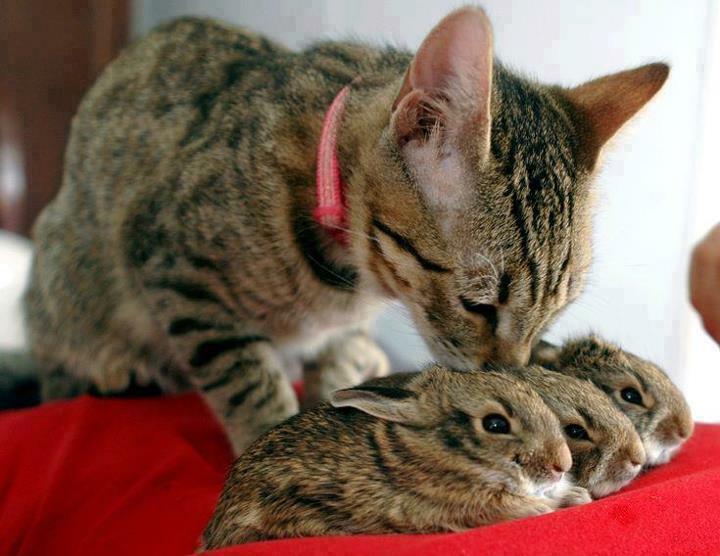 KITTY AND BUNNIES. Oh, I needed this today. Adorable. Oh my, that sounds delicious! Thanks for the link. I’m going to have to start blogging about some of my cooking escapades as well as lingerie one of these days!